Dr. Bales is originally from Redkey, Indiana. He graduated from Purdue University in 1980. Dr. Bales has practiced in Greensburg since his graduation. He and his wife, Shirley, have 3 children and 6 grandchildren. They share their home with their dog, Cyrus. Dr. Bales enjoys fishing and spending time with his grandchildren. Dr. Martin is originally from South Bend, Indiana. 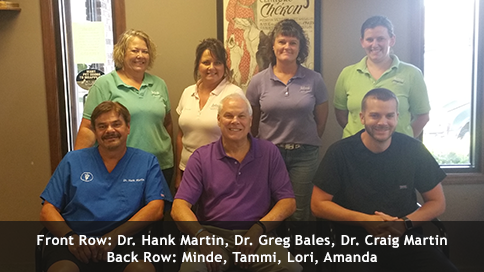 A 1981 graduate of Purdue University SVM, Dr. Martin has made Greensburg his home since then. He and his wife Sue have 4 sons, and 4 grandchildren. They share their home with their dog Seymour. Dr. Martin's hobbies include bonsai and completing marathons. Dr. Craig Martin is a graduate of Purdue College of Veterinary Medicine. Dr. Martin's areas of interest include small animal wound management and surgery, small animal medicine and reproduction. He grew up in Greensburg where he met his wife Ashley. His hobbies include fishing, hunting, being with his children and playing with his dog Mosley.